Sentinel™ integrates with SWITCHWARE® and EZswitch® to provide unattended monitoring of ATMs, core system interfaces, EFT network connection(s) and much more. Alerts can be sent by email or SMS-text to a defined staff or third party service agents at specific times depending on the nature and type of issue detected. The alerts will be escalated until the alert condition is resolved. The latest enhancements to the Sentinel product now support installing a Windows-based service on multiple servers/workstations to create a fully redundant alert system. 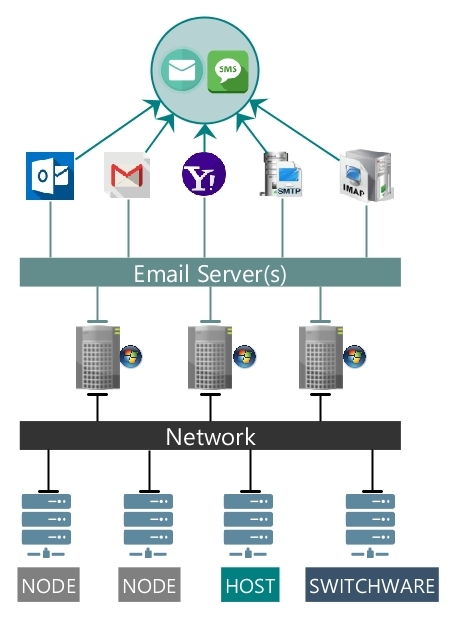 The diagram below depicts the latest architecture setup with multiple Sentinel services installed on multiple Windows platforms sending alerts to multiple email SMTP servers. If any component is disrupted the surviving Sentinel programs will create alerts that the user receives.